Ask any baseball fan who the first African-American major league player was, and nearly all will tell you it was Jackie Robinson. Ask anyone familiar with the game’s long and storied history before Robinson’s debut in 1947, and they’ll tell you it was Moses Fleetwood Walker and his brother Weldy, who broke into the game in 1884. Very few, if any, would tell you that it was a man named William Edward White who became the first African-American to play in a major league baseball game in 1879. Had it not been for a few keen researchers, William Edward White’s name would have been lost to baseball history, perhaps forever. In terms of his major league career, White’s story begins and ends on 21 June 1879. 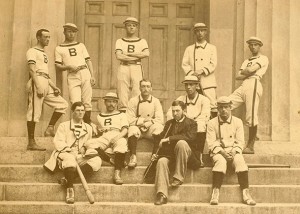 It was on this day that White, a first baseman for the Brown University baseball team, was called upon by the local Providence Grays of the National League to fill in for their starting first baseman, Joe Start. During that game, White went one for four and scored a run, a fairly unremarkable day. Although Start would be out for another month, White never played another major league game, and like Moonlight Graham, he disappeared after a brief but significant appearance. While working towards achieving their goal of having a biography of every player to ever set foot on a major league field, historians from the Society of American Baseball Researchers (SABR) came to a startling realization about William Edward White: he was at least part African-American. The trail began with records obtained from Brown University which state that White was born in Milner, Georgia, in 1860 and left school in 1880 without graduating. The records also indicated that William’s father was a man by the name of A.J. White. According to the 1880 census, the only A.J. White in Milner was Andrew J. White, a 65-year-old white man with no wife and no children. However, Mr. White did have a 35-year old multi-racial woman named Hannah White living with him. The 1860 Census shows Andrew J. White owning seventy slaves. In the 1870 census, Hannah White was found living with her mother and three children, one of which was a 9-year-old multi-racial boy named William White. According to an article on the research involved in this mystery published in The Wall Street Journal, Andrew J. White was “a well-to-do merchant and railroad president, so he would have had the means to send a mixed-race child north to be educated.” In 1900, William Edward White was living in Providence, Rhode Island, and is recorded on the 1900 Census as ‘white’ despite being one quarter African-American, making him legally black under most state laws at the time. At a courthouse in Zebulon, Georgia, SABR biographical researcher Peter Morris located the will of Andrew J. White dated in 1877. 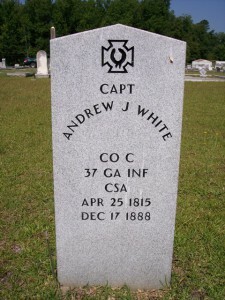 According to this will: “All the balance of my Estate, both Real and Personal of Every Kind and description … I do hereby … bequeath unto William Edward White, Anna Nora White, and Sarah Adelaide White, the children of my servant Hannah.” Finally, William Edward White was linked to Andrew J. White and his servant Hannah, proving that the man who played one game in Major League baseball in 1879 was the game’s first African-American player. Further proving this link, later in the will, White notes that William and a sister are “now at school in the north.” Andrew J. White never refers to Hannah’s children as his own. 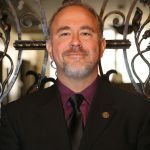 The dedicated work of historical researchers who pored over census records, local histories, and probate records from a small town in Georgia (today Milner has a population of 522) were able to change a long standing belief about the history of America’s pastime. 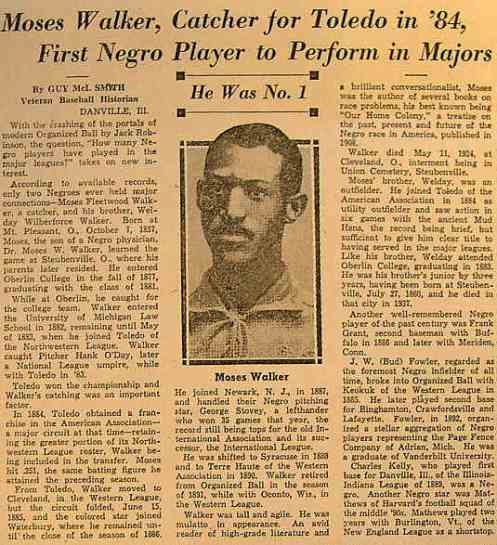 Moses Fleetwood Walker played catcher for the Toledo Blue Stockings of the American Association (regarding by baseball historians as a major league) for one season in 1884. His brother, Weldy, played six games for Toledo that same season. Fatsis, Stefan, and Peter Morris, “Baseball’s Secret Pioneer,” Slate, 4 February 2014. 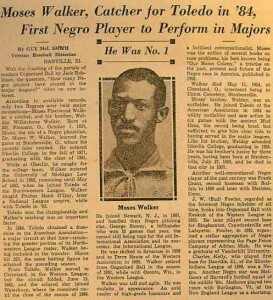 Fatsis, Stefan, “Mystery of Baseball: Was William White Game’s First Black?” The Wall Street Journal, 30 January 2004. Probate Records of Pike County, Georgia, Will of Andrew J. White, dated in 1877.
http://www.slate.com/articles/sports/sports_nut/2014/02/william_edward_white_baseball_s_first_black_player_lived_his_life_as_a_white.single.html I feel strongly a movement to have his gravesite marked if it is not already should be undertaken. Bravo! This is really fascinating. I also support the above suggestion that White’s grave receive a marker. They had a descendant of his on Antiques Roadshow recently! I recognized his photo before I even saw his name…..